I love some Lousiana cooking! 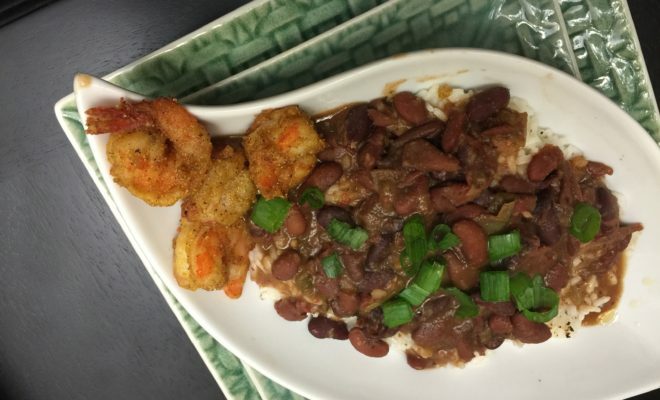 This red beans and rice recipe will make you feel like you’re in New Orleans even though you’ll never leave your dinner table. This is truly one of my family’s favorite dishes!! My husband is originally from Alexandria, LA, and let me tell you, this is a must have in our home. This is perfect for Sunday or Monday dinner. You can eat alone or add some fried Cajun shrimp or fish. 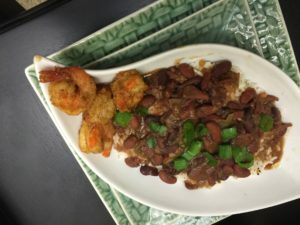 Just a little background on the dish before I go on: in New Orleans Monday was “wash day” and women would heat up some sausage or field chicken and serve it on top of red beans and rice. Most of my dishes have Cajun and Creole influences, and I can’t wait to share more of them with you. Sweat the onions, bell peppers and celery in the rendered bacon fat in a heavy soup pot over medium-high heat. Once the onions become translucent, add the kidney beans, ham hocks or neckbones , andouille sausage, bay leaves and cayenne, then add water to cover by 2 inches. Increase the heat and bring the water to a boil. Cover the pot, reduce the heat to low and allow the beans to simmer slowly for 2 hours. Periodically stir the beans to make sure that they don’t scorch on the bottom of the pot, adding water if necessary, always keeping the beans covered by an inch or more of water. Continue cooking beans until they are creamy and beginning to fall apart when they’re stirred.